An alternative construction with coaxial cable that is more symmetric is shown above. It is two pieces of RG58 with the shields fanned out and twisted into pigtails which will be the two terminals of the device. The inner conductors are connected across to the other cable’s shield. The cross connects are kept separated, as are the shield ends, and the space if filled with hot melt adhesive (which is electrically similar to polyethylene). Likewise, I have made sure the cut ends are clean of whiskers and used hot melt adhesive to insulate the parts from each other. The prototype withstood 2.2kVp and the weak point was the open ends of the RG58. RG58 is strong internally, flashover occurs across the ends… so whilst the neatest smallest pigtails are good for RF, they are not conducive to high voltage withstand. By stripping the braid back 5mm and separating the braid ends similarly, it withstands 4.5kVp. 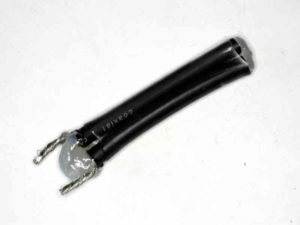 Most ham ATUs cannot withstand even 2kVp, even though the capacitors may be rated for higher voltage, they tend flash over at coax connectors. There are three open circuit transmission line stubs in parallel. The first is formed by the outer surfaces of the two pieces of parallel RG58 with PVC jacket insulation. 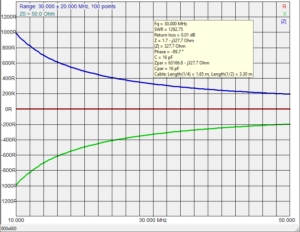 This turns out to have Zo close to 50Ω and VF around 0.6-0.7. The second and third stubs are formed by the inner of each of the two pieces of RG58. Because the three TL sections are close to Z0-6=50 and VF=0.66, we can treat them as a single stub with Zo=16.7 and VF=0.66. It is an approximation, but a good one considering the relative magnitude of error due to the pigtails when used on very short stubs as in this case. In my correspondent’s case, his 70mm single RG58 stub could be replaced with the triple stub of length 20-25mm, enhancing symmetry by both the symmetric structure and smaller size. Above is a measurement of the prototype. 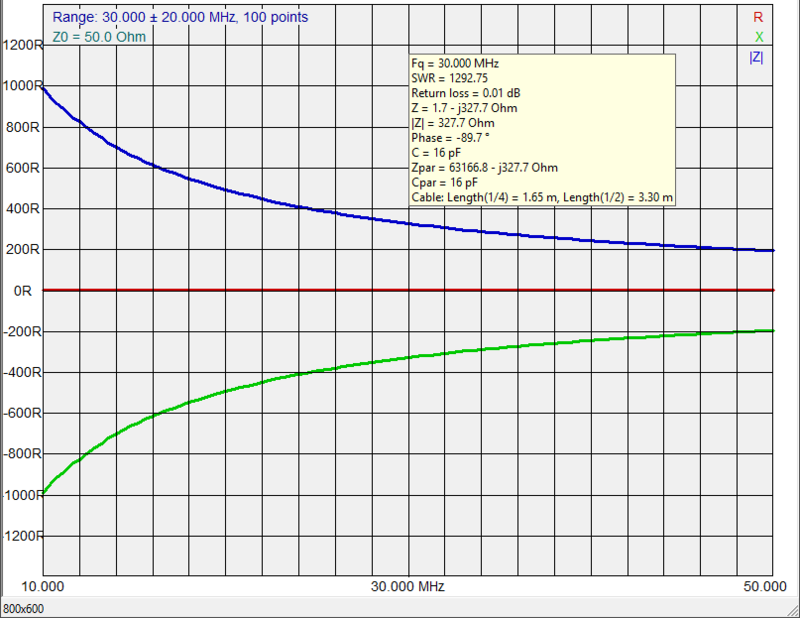 The observed capacitive reactance reconciles with 55mm of Zo=16.7 and VF=0.66 TL. When the stub is very short electrically (<6°), its impedance is well approximated as the line’s capacitance per unit length of 1/(Co*vf*Ro). In this case, C=1/(299792458*0.66*16.7)=302pF/m, and the 55mm length should be about 302*0.055=16.6pF which reconciles with the chart above.